On selfmade, small, skateboard-like boards with rollers, 12 men are chasing the ball on one of the largest crossroads in the Togolese capital Lomé. The men are strapped tight on their rolling boards. Her muscular upper body immediately stands out. At second glance you recognize the stunted legs of the athletes. The two goalkeepers have only one leg. This photo was sent by our friend Blaise in the late summer of 2017, when we prepared our first visit to Togo. 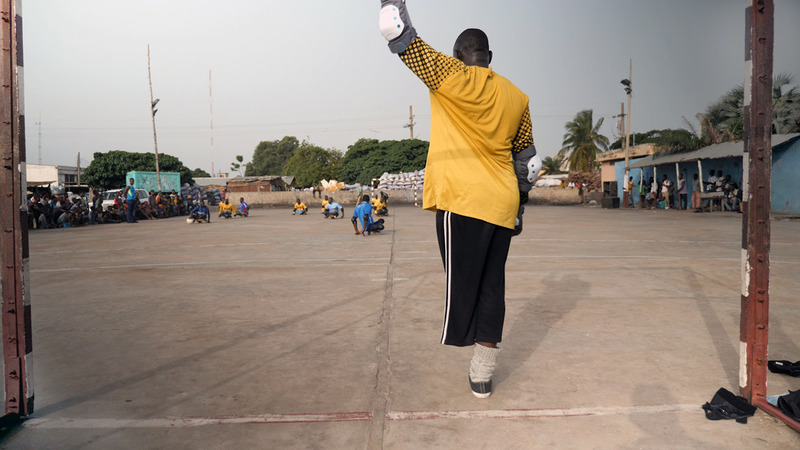 6 months later we meet the skateboard players in Lomé at an extra organized tournament. We have knee and wrist protectors for everyone, jerseys, footballs and gloves. So far, injuries have often occurred, as most have slipped over the rough and dirty asphalt without knee pads. Even open wounds on the hands were not a uncommon thing. Many of the athletes had only protected themselves with broken flip flops on their hands. The disabilities date back to their childhood. Many of them do not know why they have disabilities at all. Some have been telling us that they got sick in childhood after the game. Their mothers did not know what kind of diseases their children had. Untreated, some of their siblings did not survive. Moumoudi survived. Compared to his very muscular upper arms, his legs look like those of a child. Obviously these are untreated polio diseases. To this day, there are no nationwide vaccinations against polio and other infectious diseases. The vaccine is readily available and comparatively cheap. 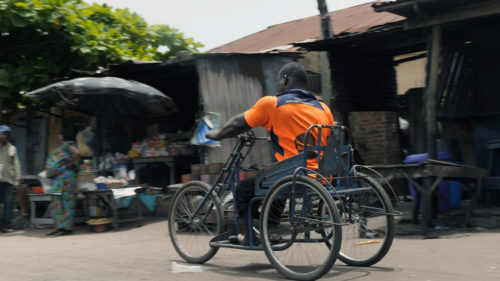 In countries like Togo, physical disability also means being excluded from the job market. 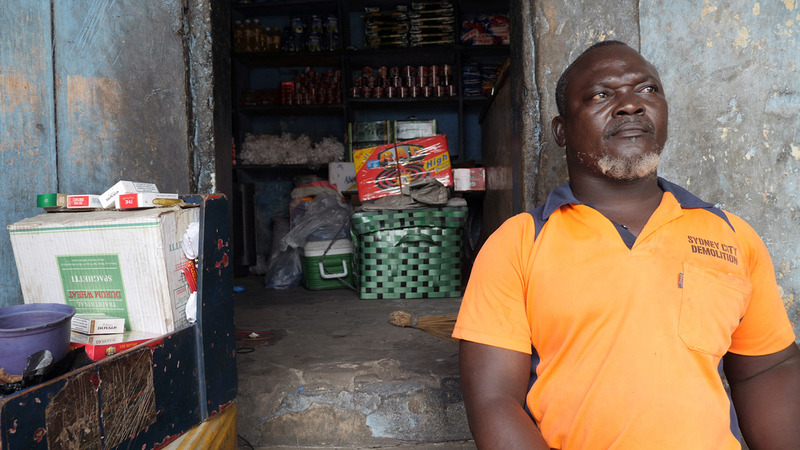 The very difficult economic situation makes it almost impossible for people like Moumoudi to pursue a regular job. For many of them, there is nothing left but to go begging to afford the survival and tuition of the children. Moumoudi was lucky. A friendly operator of a small supermarket occasionally brings him goods that he is allowed to sell. He may keep the proceeds. He runs a small shop in his neighborhood Amoutive, barely larger than a wardrobe. Unfortunately, the money is often not enough at the end of the month. And so he and his wife have to go begging in the market to fill up the family fund from time to time. The sport not only distracts them from the harsh everyday life, but also adds a small amount of income by the donations of the spectators. A hat is handed round while the match. And many throw in change. We are surprised by the great solidarity of the Togolese people. 30 minutes before kick-off, almost the whole square is circled by spectators. Curious and admiring, they watch the game and cheer the 12 men on their trolleys. Skateboard-Ball unites the men in their common handicap. They get the recognition that they are often denied in everyday life because of their disability. The special thing about the skateboard players, however, is the cohesion. If one of them is ill or in financial need, they help each other. The joint club treasury also serves as a reserve for medical expenses. The athletes were very happy with our donations. The new jersey set was put on for the first match. Especially the new leather balls were a highlight. So far, they had to settle for just one old, worn-out ball.Together with Blaise and Aniel we organized a lovely party. After the matches a rich program with groups of dancers, dancing stiletto artists and a traditional live band and followed. Finally we had dinner all together. Of course we paid the expenses on this day. We came to this project via a friend from Togo. Blaise came to spend a year in Germany on an NGO Exchange Project, and while he was here played in the same football club as Marc, the DJK-Ost Karlsruhe. They became good friends and they told each other a lot about the differences in football in the two countries. Blaise supports football groups in his country. The young people there don’t have access to football kit such as boots, shirts, shorts, socks and balls, but now you can help them! In Lomé, the capital of Togo, every Friday evening at the same time a group of football enthusiasts roll on to the main road on home-made skateboards. They all have something in common – a physical disability. In African society this often makes it difficult to cope with everyday life or even to get a job. But these people in Togo haven’t let this defeat them and have joined forces to invent a new sport – skateboard-ball. They sit on home-made boards with rollers and push themselves along using their arms. After the game, the skateboard-ballers ask the spectators for small donations, but unfortunately these are never sufficient to enable them to live a decent life. Despite their difficult circumstances the skateboard-ballers are enthusiastic players. But they have none of the kit that German footballers have. Rollers are very hard to get hold of in Togo, and are often very bad quality, which means that the players are more likely to fall. And then they don’t have enough money to pay for the visits to the doctor which are so important for people with physical disabilities. In emergency situations the community supports some individuals. So the skateboard-ball team is a very special team. Initially we want to give the skateboard-ball group pleasure by donating the things they need. Team shirts, shorts, goalkeepers’ gloves, skateboards, rollers, balls, and goal nets. These things will allow them to play better and more safely. And they will also make it possible for them to bring in the money they so urgently need. 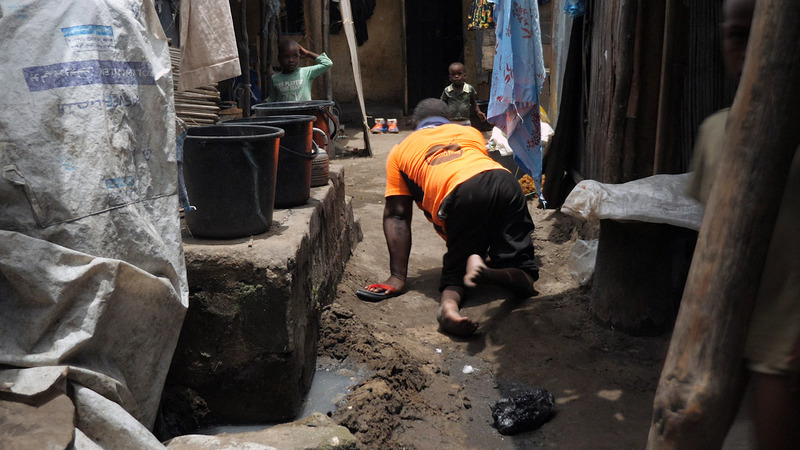 The second stage will involve trying to improve their daily lives, by providing wheel-chairs and the opportunity to take out health insurance, which is far from being universal in Togo.